On a chilly winter day in January students at North Buncombe Elementary warmed up with a hot cup of soup. But it wasn’t garden-variety chicken noodle or vegetable soup in their cups, instead students were sampling a local apple and butternut squash soup from Biltmore chef Mark DeMarco. The event was part of Biltmore’s sponsorship of the Growing Minds program and was well received by the students and teachers at the school. Some kids were a little hesitant to try the soup at first, but were more eager once they saw how much their peers enjoyed it. 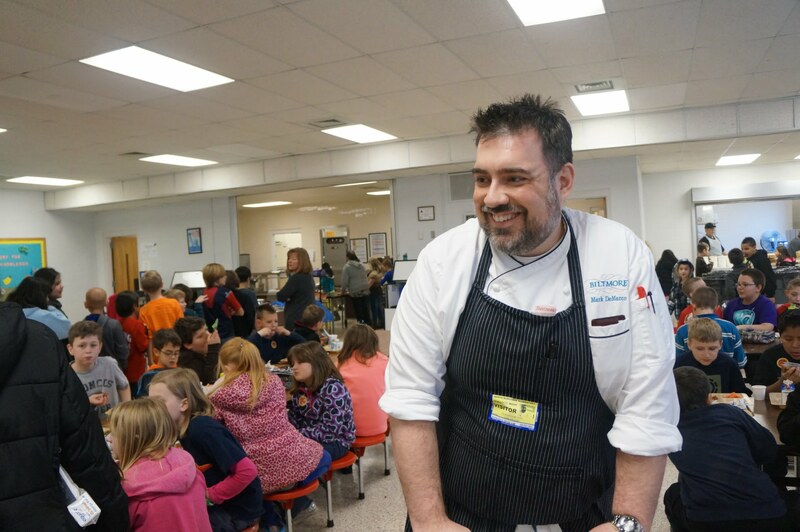 After the taste test we asked Chef DeMarco to share with us his culinary background, why local food is important to him, and what he thought of sharing his soup recipe with over 700 kids! What’s your background? How did you become a chef at Biltmore? My entire family cooked when I was growing up. My grandmother owned a pizzeria and catered out of our house, so I’ve always been around food. I graduated from culinary school in the class of 1999 at IUP Academy of Culinary Arts in Punxsutawney, PA. I began working for one of Biltmore’s restaurants, Bistro, in 2004 as a cook II and then moved on in 2010 to become the first chef of Biltmore’s newest restaurant, Cedric’s Tavern. Why is sourcing from local farms is important to you and Biltmore? I think that sourcing local speaks to George Vanderbilt’s vision when he built Biltmore House: helping to support and give back to the community that surrounds us. Part of his vision was for Biltmore to be a working, self-sustaining estate. Mr. Vanderbilt’s descendants still own Biltmore and all of us work to keep that vision alive. I feel lucky to have a farm, literally, at my fingertips and I get to serve a lot of estate-raised food from our Field-to-Table program. We have a production garden; a vineyard; our own free-range cattle and lamb program; and chickens and quail that lay eggs for our restaurants. We also have great partnerships with farmers throughout WNC to source local food. Tell us about Biltmore’s commitment to farm to school and Growing Minds? This program is absolutely wonderful and aligns perfectly with Biltmore’s values. George and Edith Vanderbilt were not only running the estate as a sustainable farm, but they were very involved in educational efforts for workers on the estate and for residents in WNC. It’s that legacy of commitment to agriculture and education that inspires Biltmore’s involvement with ASAP and especially the Growing Minds Farm to School program. I love how the program gives us a way to speak with many different children and introduce them to healthy, locally sourced food that they may not have an opportunity to try or may be hesitant to try, like butternut squash or kale. Do you have a favorite dish or recipe that features local food? I would say that it depends on the season and what I’m in the mood to cook. I will say that two of my personal favorite farms to work with are Brasstown Beef and Sorrell’s Creek trout farm. Brasstown Beef has some of the best beef I’ve tasted. Right now I’m working with their brisket to create a corned beef and cabbage lunch entrée that will be on Cedric’s winter menu here at Biltmore. Sorrell’s Creek has such fresh, clean tasting trout that all you need to do is pan sear it, finish it with a little lemon juice and some fresh salad greens and you have the perfect light lunch. Tell us about your experience doing the taste test at North Buncombe Elementary School? What was the best or most unusual thing a student said to you? I had an amazing time. I was a little nervous about doing our butternut squash and apple soup for such a young audience, but I was amazed at how many students tasted and really enjoyed the soup. I had several students say the soup tasted like “pumpkin pie” or “Thanksgiving”. I really felt welcomed by the staff, teachers and students of the school and they truly appreciated Biltmore and ASAP being there. I really think that they look forward to when ASAP comes out. I look forward to continuing to work with ASAP and the various programs that they sponsor. I think it is wonderful that ASAP is getting the word out about fresh, local food. As a chef, that makes my job so much more pleasurable. Thanks to Biltmore and Chef DeMarco for this fantastic experience for North Buncombe students! Next post: Announcing GM Schools!